Our periodic newsletters and health reports are designed to keep you informed on changes in the health industry as well as helpful tips throughout the year to help you avoid pit falls, all the while helping to add life to your years and years to your life. 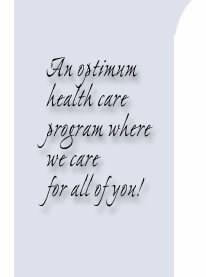 To subscribe to our monthly newsletter or to our Premier Health News e-letter send your information to info@PremierHealthCareSC.com and we will start your subscription to better health. * We never have and never will disclose your information to any third party under any circumstances.